Water will exit via small (pencil girth ) hole at bottom of engine block. [YouTube][/YouTube]Welcome to the forum. 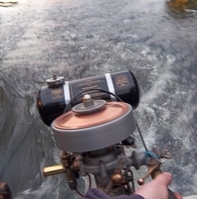 This YouTube video shows the cooling water as the engine revs increase. When running in a tub, make sure the prop is not spinning and aerating the water. Only way to do that properly is to remove the head, and clean out the waterways. This is my 1974 Century, I have not used it for about five years and after some cosmetics I started it today. The water flow to start was slow, I stopped the motor, then used a high pressure air line on the water exit on the block, lots of bubbles later I restarted and the water flowed as normal. This is an example that has had little use. Horsley-Anarak wrote: This is an example that has had little use. Thanks, and very nice too!